“Thomas Atkins” — “Tommy” for short — was a name used to designate the typical private soldier in the British Army. The term seems to have moved into general usage after appearing in the Army’s official specimen forms from 1815 onward. For example, the 1837 King’s Regulations & Orders for the Army gives “Thomas Atkins” as the example for a specimen form: “Character: Thomas Atkins has been a well-conducted Soldier; was wounded at — –, and has distinguished himself by several acts of bravery. Signed — –, Commanding Officer” (210). Many soldiers and civilians objected to the term, seeing it as overfamiliar rather than friendly. The Daily Graphic, for example, recorded on 23 February 1801 that “a vigorous protest is being made on behalf of the dignity of the British line against the use of the too familiar sobriquet ‘Tommy’” (7). Rudyard Kipling’s poem “Tommy,” first published in The Scots Observer on 1 March 1890, captures some of the motivations behind the protest against calling soldiers “Tommies” – and, more importantly, describes British civilians’ hostility and disdain for private soldiers on leave. The poem’s refrain makes clear the contemptuous connotations of the name “Tommy,” suggesting that “Tommy” usually introduces a command or rejection, whereas “Mister Atkins” promises empty praise. 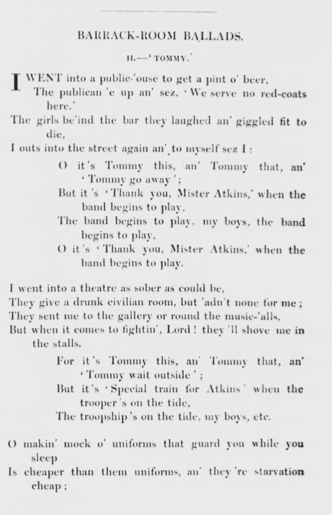 Additionally, while reprints of the poem give its title as “Tommy,” the original printed version puts the name in quotation marks as “ ‘ Tommy.’ ” More research is needed on this textual detail: did Kipling use the quotation marks deliberately, perhaps to indicate that he does not endorse the use of the name as a title for private soldiers, or are the quotation marks an accidental feature of the poem’s history in print? The civilian hypocrisy Kipling denounces in these poems was very real in Victorian Britain. Unlike the private soldiers of World War I, who were generally welcomed home as heroes, working-class soldiers without commissions occupied a miserably paradoxical position in the late nineteenth century. In the words of David French, “on the one hand flesh-and-blood rank-and-file soldiers were shunned by much of ‘respectable society. […] On the other hand, the soldier in the abstract had become an icon held in growing public esteem” (232-3). Regiments mainly consisted of unmarried young men, who frequented pubs, beer halls, and brothels in the pursuit of entertainment and “female company” (248), becoming so notorious for public misconduct that service in the Regular Army “continued to carry a deep social stigma” among the respectable working classes (249). Furthermore, the Army was a dreadful employer. Army pay was subject to compulsory stoppages to pay for laundry, damages to equipment, and extra rations: taking these expenses into account, “only the Irish farm worker was worse off financially” (Skelley 193). It was difficult for ex-servicemen to find work; army pensions were insufficient, leaving many in the workhouses or in receipt of poor relief (210-11); and there were no pensions for widows and orphans of non-commissioned soldiers between 1856 and 1899 (216). Consequently, most recruits were either “teenagers […] capable of earning only a boy’s wages,” criminal offenders, or the terminally unemployed, which “created a vicious circle and perpetuated the impression that the Regular Army offered work that was fit only for paupers, criminals, and those too lazy to find proper jobs” (French 250). Meanwhile, military memoirs, military music, and military spectacles — such as reviews, parades, field days, embarkations, and funerals — were wildly popular among all classes of Victorian society (Myerly 143-7). The Scots Observer was a Tory-Imperialist weekly journal, based in Edinburgh. In November 1890 The Scots Observer’s headquarters were transferred from to London, and it became The National Observer. Poet and critic William Ernest Henley edited the periodical between 1889 and 1893. Despite the move to London, and the reputations of contributors such as J. M. Barrie and W. B. Yeats, the Waterloo Directory of English Newspapers and Periodicals lists the journal’s circulation as a mere 2000 p/a. “Tommy” thus began to enter the national consciousness only in 1892, when Methuen published a volume of Kipling’s poetry, Barrack-Room Ballads and Other Verses. The ballads were favourably reviewed in The Pall Mall Gazette (7 May) and The Graphic (14 May). On 11 April 1893, The Times reported that “a group of several of Mr. Kipling’s ‘Barrack-room Ballads,’ set to music by Gerald F. Cobb, should not be long in attaining popularity” (3). French, David. Military Identities: The Regimental System, the British Army, and the British People, c. 1870-2000. New York: Oxford U P, 2005. Print. Myerly, Scott. British Military Spectacle: From the Napoleonic Wars through the Crimea. New Haven: Harvard U P, 1996. Print. Skelley, Alan Ramsay. The Victorian Army at Home: The Recruitment and Terms and Conditions of the British Regular, 1859-1899. Montreal, McGill-Queen’s U P, 1977. Print. O it’s ‘Thank you, Mister Atkins,’ when the band begins to play. The troopship’s on the tide, my boys, etc. The drums begin to roll, my boys, etc. There’s trouble in the wind, my boys, etc. The Widow’s uniform[vii] is not the soldier-man’s disgrace. [i] Publican, n. The owner or manager of a public house or tavern (OED). [ii] Red-coat, n. “An English soldier; (later) a soldier of the British army” (OED). [iii] Assuming that the band is playing military field music, this line signals a march to war. On the other hand, military bands also played at military funeral ceremonies, and in public performances of national anthems and other patriotic songs. [iv] Stalls, n. Ground-floor seating “arranged in rows in front of the [orchestral] pit in the theatre” (OED). Stalls were first introduced in 1849 by the Drury Lane Theatre in London, and by 1886 all the theatres in the West End had stalls. Theatres enforced dress codes for the more expensive seating in the stalls, the boxes, and the dress circle (Oxford Encyclopedia of Theatre and Performance). [v] Trooper, troopship, n. A ship for transporting soldiers (OED). In this case, the troops are presumably foreign invaders, with Tommy summoned to travel by train to the coast. [vi] Refers to military action by the 93rd Highland Regiment of the Sutherland Highlanders, at the Battle of Balaclava on October 25 1854. The line was “thin” because Sir Colin Campbell organized the troops into a line two men deep, instead of the conventional four men deep. William H. Russell, correspondent for The Times, described the 93rd as a “thin red streak tipped with a line of steel” (November 14 1854). This phrase became the “thin red line,” a figure of speech for any British military unit that managed to repel attackers despite relatively limited manpower. [vii] Refers to Queen Victoria, the “widow of Windsor.” Her long period of mourning had somewhat diminished her popularity. (See also Kipling’s satirical poem “The Widow at Windsor” (1890), which was the first of the Barrack-Room Ballads published in The Scots Observer.) Wearing “the Queen’s uniform” was a visible sign of being a private soldier.